The China 299B Module of ITEM ToolKit is a powerful reliability prediction program based on the internationally recognized method of calculating electronic equipment reliability provided in the Chinese Military Standard. This standard uses a series of models for various categories of electronic, electrical and electro-mechanical components to predict failure rates that are affected by environmental conditions, quality levels, stress conditions and various other parameters. The China 299B Module provides a user friendly interface which allows the user to construct, analyse and display system models using interactive facilities. Building a hierarchy and adding new components could not be any easier. The program calculates the failure rates associated with new components as they are added to the system, along with the overall system failure rate. Project data may be viewed both via grid view or dialog view simultaneously, allowing predictions to be performed with a minimum of effort. Library management, import and export facilities are also provided. 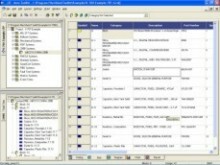 Quality user-configurable reports are produced by the program automatically. In addition data may simply be dragged and dropped into Microsoft applications such as Word, Excel, Access etc. allowing a wide range of additional customised reports and charts to be produced. ITEM ToolKit contains five modules for performing reliability prediction (MTBF) analysis. These modules conform to MIL-HDBK-217 F Notice 2, Telcordia (Bellcore) TR-332 and SR-332, IEC 62380 (RDF 2000), China 299B GJB/z 299B (electronics) and NSWC 06 (mechanical) and share many common features and capabilities. Each reliability prediction module is designed to analyse and calculate component, sub system and system failure rates, including Mean Time Between Failure (MTBF), in accordance with the appropriate standard. After the analysis is complete, ITEM ToolKit's integrated environment comes into its own with powerful conversion facilities for transferring data to other modules of the program. For example, transfer your MIL-217 project data to FMECA or your Telcordia project to RBD. These powerful facilities transfer as much of the available information as possible, saving you valuable time and effort. ITEM ToolKit's Multi Document Interface allows several projects or libraries to open at the same time. This valuable feature comes in especially handy when it is necessary to transfer data from one project (or library) to another. Users can construct hierarchical breakdowns of systems with no restrictions on block numbers or levels of indenture. As new sub blocks and components are added, ITEM ToolKit automatically recalculates all dependent failure rates to take account of new information. Powerful global editing facilities are available for performing "what if" evaluations. These facilities enable you to experiment with temperature, environmental and stress settings and see how your system performance will vary. To download a free demonstration of our China 299B software click here.